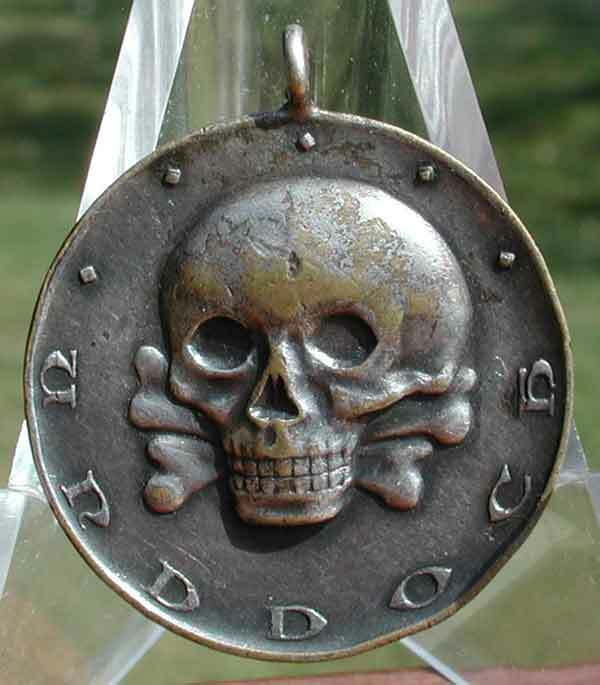 1919 Freikorps Iron Division Medal: Obverse: skull and cross bones insignia with motto "und doch" (and yet, nevertheless); supposedly the source for the NSDAP Blood Order Medal slogan "Und ihr habt doch gesiegt." Reverse: Baltic Cross shield and 1919 date to symbolize the struggle of German troops to keep control of Latvia which Russia ceded to Germany in 1917 in the treaty of Brest-Litovsk. After Germany lost the war on Nov 11, 1918 the Iron Division in March of 1919 began to fight the Bolshevik forces for control. The Freikorps saved Latvia from capture by the Red Army in the spring of 1919. The British then ordered, and the Weimar Republic obeyed, all German troops had to withdraw from Latvia in June of 1919. The German soldiers viewed this order as a "stab in the back." Nickel plated tombac, die struck, full high relief details, 33 mm, 11.62 gm, missing ribbon loop, a scarce medal, moderate wear. Instituted in April 1920 by the Association of the Iron Division former members. An initiative for the institution of this award came from the commander of the West Russian Volunteer Army count Major-General Pavel Bermondt-Avalov (b. 04.03.1877 d. 27.12.1973). One of many Freikorps, the Iron Division was raised on January 18, 1919 in Wainoden by an experienced German officer Major Josef Bischoff out of remnants of German 8th Army, the Freikorps Iron Brigade (Eiserne Brigade), and numerous volunteers. On October 06, 1919 it was absorbed by the West Russian Volunteer Army and disbanded on December 31, 1919. Association of the Iron Division former members was formed on March 01, 1920. Iron Division former military personnel, non-combatants who assisted that unit in fighting Bolsheviks and those who supported post-war activities of the Association were eligible for this commemorative medal. Award documents were issued to those persons, and the medal itself had to be bought by veterans upon presentation of these certificates. Cost of medal ranged from RM 6,50 to 8,00. Round medal was 33 mm in diameter and was made of various alloys with silver finishing. Obverse had an image of a “death’s head,” and bore the semi-circular legend “And yet” (“Und doch”) at the bottom as well as five small diamonds at its top. 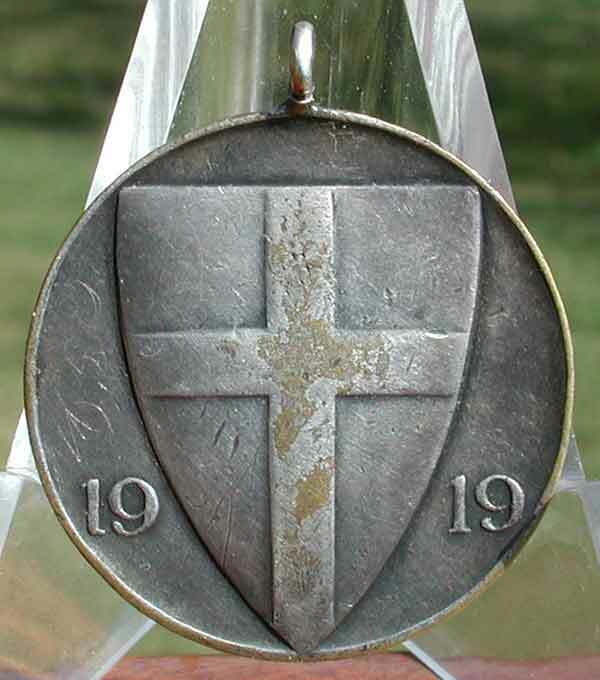 Reverse had an image of large triangular shield with vertical cross within and the numerals “19” and “19” left and right, forming the year “1919” the Iron Division existed. Official black 25 mm wide ribbon had two thin 1 mm wide vertical white stripes close to the edges. Unofficial ribbon had two wide 4 mm stripes. The medal was available for private purchase in 1920 till the middle of the 1930s until it was prohibited for wear. Slightly more than 3,000 medals were issued.